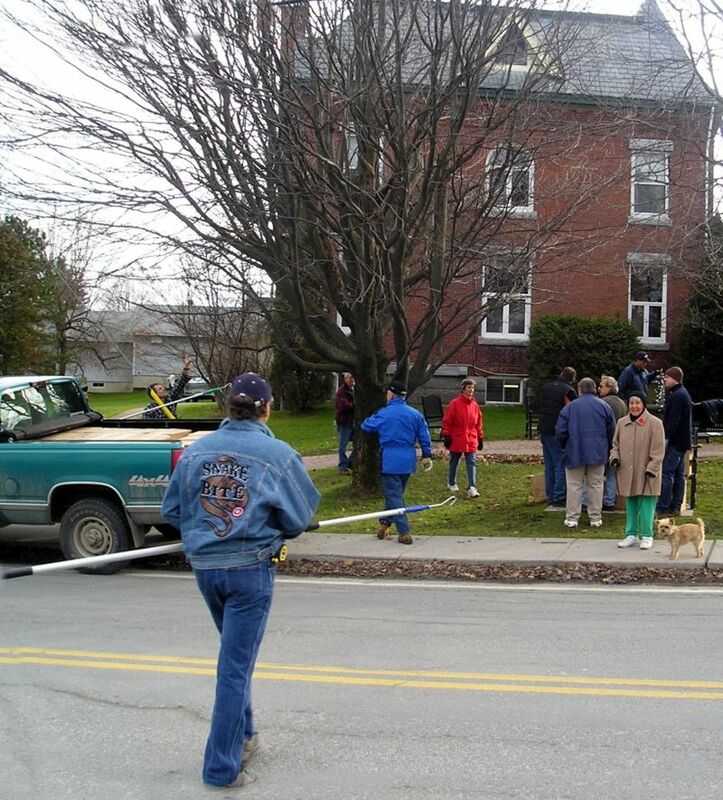 Saturday morning in downtown Knowlton was a bustle of activity as over two dozen volunteers converged at the Pettes Library to begin stringing new Christmas lights for the Festival of Lights, also called Winter Lights of Knowlton, coming in December. 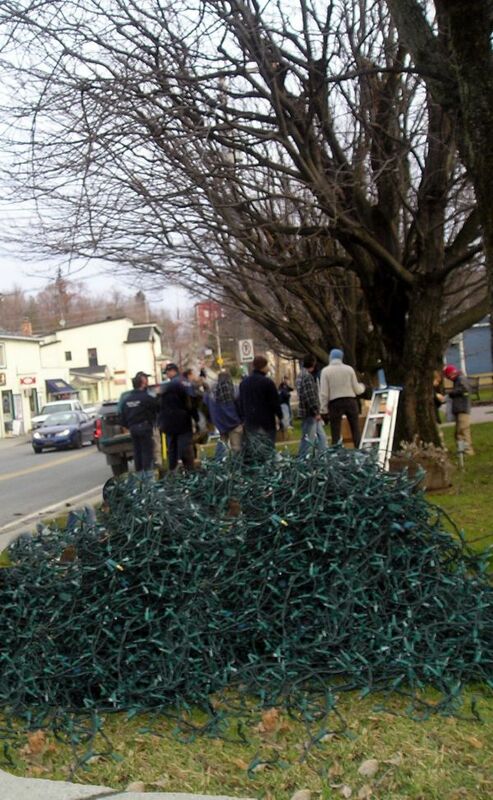 The Brome Fire Department was on-hand climbing ladders and stringing lights along with members of the Chamber of Commerce and proud residents who make it their duty to keep Knowlton vibrant in appearance and in spirit. A truckload of new, energy efficient LED Christmas lights was unloaded at the corner of Lakeside and the volunteers spread out around town with long grappling poles getting the lights up into as many trees as possible. The morning weather was mild and children gathered to watch the action. The whole process seemed to go rather well with the hardworking group finishing the entire load of lights in no time. Certainly it has taken many of us longer to un-tangle our own Christmas lights that are always in a tangled pile in the basement! The light string teams worked well as teams: some pulled down the old lights, some opened and tested the new lights, some held the ladders as the firefighters reached to their arms lengths to position the light strands just perfectly! Now we have determined how many Knowltoners it takes to screw in a light bulb! The Christmas lights are a big tradition in Lac Brome as the streets and storefront are decorated for the Winter Festival which runs throughout the month of December. The Mill Pond Park will be equipped with a skating rink and many local restaurants and businesses have specials for the tourists who come to enjoy the Eastern Townships in winter as the area turns into something out of a Christmas card, an idyllic place for families to spend time together in celebration. 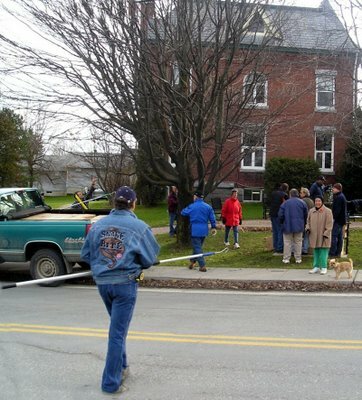 It was great to see so many people giving of their time to get the town ready for Christmas! Way to go!